Tai Chi is for everyone. You can practice Tai Chi, regardless of your age, gender, or physical limitations. 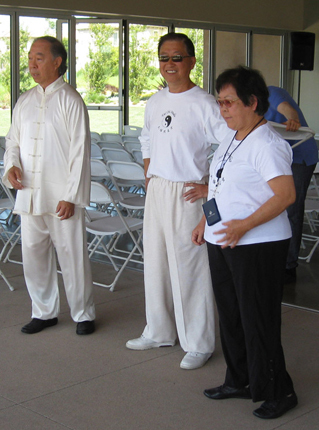 The unique Tai Chi training program offered at OC Tai Chi Studio comes directly from the way it is taught by Yang style disciples in China. From our classes you will learn not only the postures, but also internal thinking techniques for body coordination, mediation, and relaxation. We use a scientific approach to precisely describe the internal thinking process for each Tai Chi movement. Our classes are designed to answer questions related to the purpose of the Tai Chi moves, the essential Tai Chi Principles, the enhancement of energy circulation throughout your body. For other locations and more information, please email us. LEVEL I - Stretching exercises; Fundamental Tai Chi concept and knowledge; Yang style 24 forms in physical movement. LEVEL II - Extensive stretching exercises; Meditation stances; Push Hands in conjunction with practicing the entire 24 forms. Also focus on transition details in-between forms for form fluency. LEVEL III - Focus on the internal thinking techniques of each form. Learn to develop one's own thinking pattern combined with essential Tai Chi principles. For more information, or for a special appointment, please email us.